Paap Printing is a family owned and operated business. We have 14 years experience of serving Coles County and the surrounding area. No job is too big or too small for us to handle. We have a full layout and finishing department to meet your business needs. 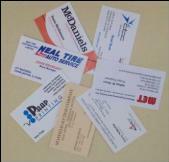 We offer services such as business cards, letterheads, wedding invitations, and much more! We hope that you will take this opportunity to learn more about Paap Printing and the services that we provide. Feel free to contact us if you would like more information.